Which outfit cost more, head to toe? Not the first one, i.e. the one that I looked fanciest in. Most people would look at the nice dress and necklace and think each one cost more than the tank top in my last look. They would be utterly wrong. The same goes for the cosmetic looks I sported. My weird-colored lipsticks look like “more” makeup than my softer pink-lipped look, yet my striking blue liquid lipstick costs $6 while my toned-down (if still colorful) look used about a dozen products and cost me mumble-mumble. The point is that just because something is visibly striking or fancy-looking doesn’t necessarily make it financially costly. If anything, in America nowadays, plain and casual-looking minimalism is the aesthetic most associated with wealth. Back when I was still ravaging my body and mind with the socially-accepted eating disorder and self-hating behavior called dieting, I could more easily fit into the clothing offered by many, if not all, mainstream brands. The world was my oyster when it came to clothes. Rep.-Elect Ocasio-Cortez is not plus-size, which means that thrift stores, clothing swaps, flea markets, various online and offline resale outlets, gently-used hand-me-downs, and other affordable clothing options are highly accessible to her. One of my favorite current shows, The Bold Type, presents in fiction what is a fact for many involved in the media. It is entirely possible to work in an industry or office where you might not be paid very much but, as a perk, have access to free or discounted outfits to borrow or keep. Rep.-Elect Ocasio-Cortez has been previously criticized for an outfits she was lent for an occasion. People I’ve known have managed to score hand-me-downs from richer bosses and coworkers while making very little from the job itself. Heck, I’ve made money profiting from things that people I knew were going to throw away because they couldn’t be bothered to sort, clean up, and sell, while I, in my desperation, was happy to do it. A lot of what makes an outfit look good isn’t its cost, but the proper care of the main garment. Skillfully tailoring, then brushing and lint-rolling, then steaming or ironing before wear can make a cheap dress look amazing. Washing it by hand and/or in cold water with mild detergent and never putting in the dryer means that the dress will last a long time. Wearing well-fitting, smooth underwear underneath will give it a good silhouette. To wit — The dress I wore when I was photographed for the New York Times? Target brand via Goodwill, $4. I still have it and it still looks great. An outfit is more than a garment and its price. What do you wear with it? How do you carry yourself when you wear it? There’s a reason why the little black dress is considered a versatile staple, and why I’ve worn the same things to parties and to work (and it’s not that I don’t care about how I look or work at a bar). There simply is more women’s than men’s clothing available — and by that I mean descriptively as “clothing manufactured and marketed as for women or men”, not prescriptively as to who is allowed to wear what. More women’s clothing is made and sold overall. More women revamp their wardrobes often than men. Women’s clothing can be less forgiving of body changes. This means the secondhand and sale markets are more generous for women than for men. That’s the primary reason why my less-fancy masculine looks cost more than my feminine ones, by the way. Looking like a well-put-together fat guy is harder than dressing like a fancy chubby femme girl. 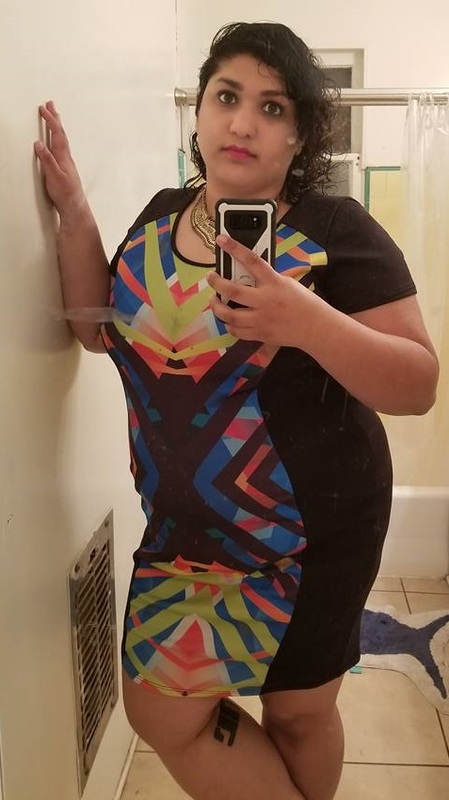 Colorful bodycon dress: free from a clothing swap. While you aren’t required to bring anything to this swap, the host asks for a $10 donation on a $5-$20 sliding scale and it is a bit of a drive for me. I think I paid $20 that time and got at least 10 items. Let’s say it cost $5, just to be generous. Black ankle-strap flats: free to me. My mother got them for me. I think they cost $20. John Elliott Jellyfish Hawaiian Shirt: $40 off Poshmark. It’s a limited-run designer item I bought because I love jellies. Sadly it never quite worked for me so I resold it. Crew Neck Black Tees: I got it in a “drawer” bundle from Basic Outfitters. Retail it’s $10. It ended up costing more like $6. I don’t recommend their tees, by the way, though their socks and underwear are good. Burdened With Glorious Queerness Biker Tank: $36, Society6. Buy one because Jadehawk is amazing. Checked shorts: bought in a bundle from Poshmark, about $7. I’m glad you’re not dieting now. As you said, it’s medically approved anorexia (and orthorexia). That stuff affects most of the people I know to some degree and it’s sad as hell. 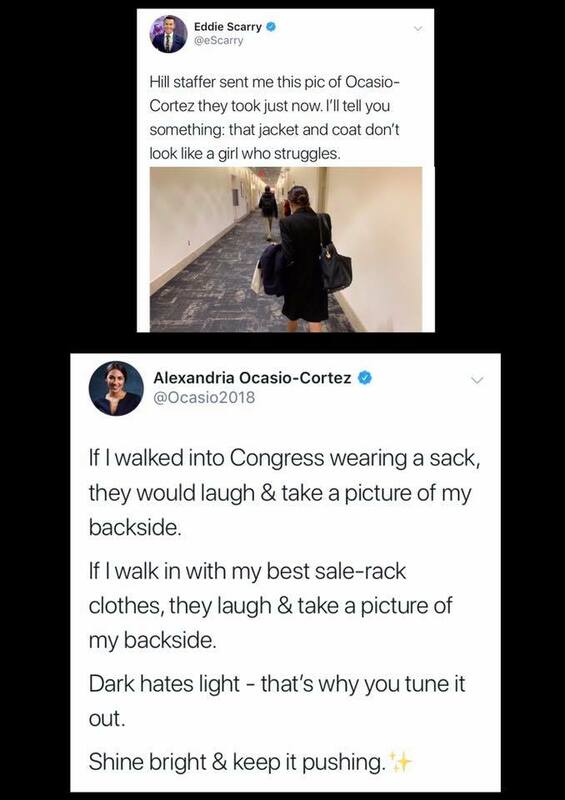 Speaking of the Notorious AOC, some conservative creeps were trying to make fun of her over another picture that kinda boggled my mind. Whether she’s looking like a goofy nerd or crisp professional or frazzled desperado living on caffeine, she always looks charming. Looks isn’t what they hate about her (except insofar as she doesn’t look very white), they’re hard-pressed to come up with a way to hate on her looks even by their own body fascist rules, but they still can’t keep themselves from hitting that angle. It’s the only thing they know how to do with women bc they don’t see ’em as human. So… I take it this is what a triggered conservative dudebro looks like? Maybe they need a content warning for competent women? … Now I wish I were a better artist. I would totally make a helpful sign for that.